The vision that began with a January 2001 contract award will be fully realized on Wednesday, May 11, when the carrier George H.W. Bush leaves Norfolk to begin its first-ever combat deployment. The 1,092-foot Bush is the 10th and final carrier of the Nimitz class. Commissioned in January 2009, the carrier, as well as its strike group, have been in training for this cruise for most of the past year. The Bush Strike Group includes Carrier Strike Group 2, the Bush, Carrier Air Wing 8, the Destroyer Squadron 22 staff, the cruisers Gettysburg, based at Naval Station Mayport, Fla., and Anzio, based in Norfolk, and the Norfolk-based guided-missile destroyers Truxtun and Mitscher. WTF????? Have we not ever heard of OPSEC? Why in gods name when we are at a hightened force protection condition due to possible retailiation over Osama, would we publicly post the date of a ships movement? We get blasted about OPSEC and the Times prints it! Just stupid to add the dates! Maybe we should give them a counselling chit and some EMI!!!! NORFOLK, Va. – The George H.W. Bush Carrier Strike Group (GHWB CSG) will depart for its maiden combat deployment May 11. The strike group and its nearly 6,000 Sailors, which includes the Navy’s newest aircraft carrier USS George H.W. 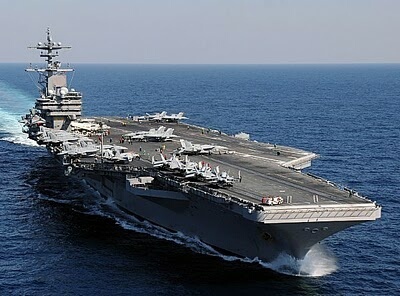 Bush (CVN 77), is scheduled to conduct operations in the U.S. Navy’s 5th and 6th Fleet areas of responsibility. This deployment is part of an ongoing rotation of U.S. forces supporting maritime security operations in international waters around the globe. Working with allied and partner maritime forces, GHWB CSG units will focus heavily on maritime security operations and theater security cooperation efforts which help establish conditions for regional stability. The five ships and eight aircraft squadrons of GHWB CSG consist of approximately 6,000 Sailors who have spent the last year conducting intensive training and certification exercises to establish a safe, cohesive organization capable of performing a wide variety of missions across the globe, ranging from anti-piracy and ground support operations to humanitarian assistance and disaster relief. The George H.W. Bush Strike Group is made up of Carrier Strike Group (CSG) 2, the Norfolk-based USS George H.W. Bush (CVN 77), Carrier Air Wing (CVW) 8, Destroyer Squadron (DESRON) 22 staff, guided-missile cruisers USS Gettysburg (CG 64) based at Naval Station Mayport, Fla. and Norfolk-based USS Anzio (CG 68), and Norfolk-based guided-missile destroyers USS Truxtun (DDG 103) and USS Mitscher (DDG 57). For news regarding GHWB CSG’s deployment, log onto http://www.navy.mil/local/cvn77, or visit the ship’s Facebook page at http://www.facebook.com/USSGeorgeHWBush. As a Navy wife, the US Navy can and will release any information as it sees fit. If the Navy seen this information as threatening then they wouldn’t post it or they would remove it. I’m sorry – but does the fact that you’re a ‘Navy wife’ give you some sort of creditbility or insight that the rest of us don’t have? If my wife is an accountant can I advise you on your taxes?